Good condition. Full working order. used item not new. We check and take over 10 pictures of every item so we can prove any fake faults. SMART FORFOUR W453 2017 IN TANK FUEL PUMP SENDER A4534700294 240534013R VIEW ALL IMAGES FOR ITEM CONDITION - PLEASE ENSURE YOU ARE 100% HAPPY WITH THE ITEM CONDITION PRIOR TO PURCHASE *PLEASE NOTE*: THE COMPATIBILITY TABLE IS FOR REFERENCE ONLY AND NOT A GUARANTEE THE PART WILL FIT YOUR VEHICLE. IF YOU'RE IN DOUBT SPEAK WITH YOUR MECHANIC AND COMPARE THE PART NUMBER (WHERE APPLICABLE) OR CONTACT US BEFORE YOU ORDER TO AVOID UNNECESSARY RETURNS IN THE INSTANCE OF A RETURN - PLEASE BE AWARE ALL OUR ITEMS HAVE THIER OWN SIGNATURE MARKINGS - PLEASE ENSURE ONLY THE ORIGINAL PART IS RETURNED AS WE WILL BE ABLE TO IDENTIFY ANY PART THAT IS NOT OURS. For Sale:-Smart Forfour 1.5cc DCi Diesel Pump with part number:- A6400700601 & 0445010096. Fits:- Smart Forfour 1.5cc DCi models made from:- 2004 to 2006. High quality products at amazing prices. The UK Mainland. 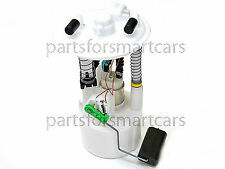 SMART FORTWO W453 Fuel Pump In Tank Sender Unit A 4534700294 172024944R. HERE WE HAVE THE DIESEL FUEL PUMP IN THE TANK FOR A SMART FORFOUR 1.5 CDI DIESEL 2004 TO 2007 SHAPE IN GOOD WORKING ORDER. SMART W453 FORFOUR 453 1.0 PASSION 3 CYLINDER 2015 MANUAL GENUINE 9K BREAKING. FUEL PUMP IN GOOD WORKING CONDITION. THE SCOTTISH HIGHLANDS ISLANDS,NORTHERN IRELAND. (Other Details: Mk 1 03-07. 0.7 Petrol. This item was removed from a 2004 vehicle. Jersey, Guernsey, Scilly Isles) as well as for the Scottish Highlands. Model: FORFOUR. Make: SMART. Part Type: FUEL PUMP (IN TANK). Cambridgeshire ,SG7 5RT. Fuel type Vehicle Colour: BLACK. Part Number Top Categories. Part Type: AUTOMATIC AIR EMISSION PUMP A0001404185. Model: FORTWO. All parts are stamped & removal of the marks will invalidate your warranty. Vehicle Colour: SILVER. Make: SMART. Cambridgeshire ,SG7 5RT. Part codes: MR597291, 58329, 0580303048. Power: 70kw, 1500cc. Model: ForFour. Fuel type: diesel. Manufacturer: Smart. Type of gearbox: automatic. The part is used: An item that has been previously used. SMART 800 SPARE CDI INTERCOOLER RADIATOR 0002490 007 0000929 V003 Q0002490 V007. Being the parts used may have slight signs of wear and tear. If indicated, what works here were from unofficial catalogue. Years, engine2015m., 52kw, 1000cc. The carSmart ForTwo II. An item that has been previously used. Item will be sold as it is shown in the pictures. Part codesA4534700294, 0580200519, 172024944R. Looking for used car parts?. SMART CABRIO Q0004681V002000000 WATER PUMP. Category veiocolo: (1) 1983/2003 UTILITY VEHICLE. Power: Diesel. PHONE 0429 88 88 32. Smart MC 01. Die Teile stehen in 77966 Kappel-Grafenhausen. Alle Karosserieteile empfehlen wir neu zu lackieren da der genaue Zustand schwer zu Beschreiben ist, trotz vieler Fotos. 599 Benzin. Smart MC 01. Alle Karosserieteile empfehlen wir neu zu lackieren da der genaue Zustand schwer zu Beschreiben ist, trotz vieler Fotos. 599 Benzin. 495116: 0975029901 0003412V Smart Smart Electric Fuel pump 1999. 495116: 0975029901 0003412V Smart Smart Kuro bako siurblys 1999. 495116: 0975029901 0003412V Smart Smart Kraftstoff-Fördereinheit Kraftstoffpumpe 1999. This listing is for the following part from a Smart ForTwo 451: PART NAME: Diesel injection pump/High pressure pump Please note that it is YOUR responsibility to check that this part is suitable for your vehicle. Please call us if you are unsure. Electronic Parts are not returnable due to the fact that we cannot ensure your equipment has not damaged our part when connected. We do not offer a 'trial service' to help you diagnose your faults. All body panels are used, and will most probably have scratches, scuffs and storage marks on them. Please always assume that they will need re-painting.